George Frideric Handel (1685-1759) http://gfhandel.org is rightly best known for his great oratorio The Messiah yet, for those not familiar with his other English oratorios, there is much to discover. Given the number of oratorios (there are over twenty and I do not have every single one myself) many people may be put off further investigation. One way of dipping into these works is to acquire recordings of arias from the oratorios, a useful stepping stone before going on to hear complete oratorios and a route that can bring rich rewards in itself. 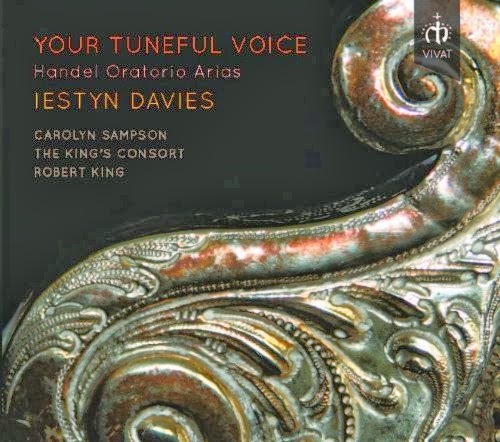 A February 2014 release from Vivat Music www.vivatmusic.com features The King’s Consort directed by Robert King http://tkcworld.org with countertenor Iestyn Davies www.iestyndavies.com and soprano, Carolyn Sampson www.carolynsampson.com in a selection of fine arias from the oratorios that works as a terrific collection in its own right. The disc opens with the aria O sacred oracles of truth from Belshazzer with some wonderfully rich yet gloriously textured sound from the King’s Consort. Iestyn Davies brings his sure touch to this aria, a voice that has a creamy texture and lovely vibrato that avoids any edge or shrillness. Superb. Lovely woodwind sounds permeate Mortals think that Time is sleeping from The Triumph of Time and Truth. What superb control Davies has, every little turn and inflection is wonderfully managed, with an upper range that is mellow and full of strength. The decorative rising scales are wonderfully managed. Tune your harps to cheerful strains from Esther, highlights Davies’ vocal range with his lower voice so rounded, beautifully full and controlled. There is some lovely oboe playing throughout. Trumpets open the lively aria Mighty love now calls to arm from Alexander Balus. When Davies enters one can’t help marvelling at his vocal dexterity, superb control yet such a natural freedom to his singing. A terrific aria. The King’s Consort intersperse these arias with two overtures, the first, from Jephtha, showing just why this period band is still one of the top period ensembles in the world. Ensemble is, of course, spot on and their playing lively, with such a light touch. There is a lovely flow to their playing with a superb balance of instrumental sounds. A joy to hear. There follows a gloriously sung Eternal source of light divine, this time from Handel’s Birthday Ode for Queen Anne, a poignant piece with beautifully judged orchestral sounds including a fine trumpet part from the wonderful Crispian Steele-Perkins, making this rather a special performance. A gentle contrast comes with Welcome as the dawn of day from Solomon where soprano Carolyn Simpson joins to duet with Iestyn Davies, both blending exceptionally well. Your tuneful voice my tale would tell from Semele, gives this disc its title. More operatic in nature, but performed by Handel as an oratorio, it draws so many fine textures from Davies’ voice, right across his range. He gives this aria just the slightest feeling of melancholy, restrained and never overdone. Yet can I hear that dulcet lay from, The Choice of Hercules, is one of Handel’s loveliest arias sung beautifully by Davies with a lovely flow and superb control whilst there is nicely crisp playing from The King’s Consort in Up the dreadful steep ascending from Jephtha with more superbly controlled phrasing from Davies. There are some lovely ripe brass sounds in the fleet and lively overture to Samson with playing of the highest order as well as a lovely, flowing final Menuetto. Thou shalt bring them in from Israel in Egypt brings an intimate quality from Iestyn Davies with mellifluous phrases, delicate little decorations and some lovely playing from The King’s Consort. Carolyn Sampson returns to join Iestyn Davies for Who calls my parting soul from death from Esther, a gently plodding aria that, even more than Welcome as the dawn of day, brings a superb blend of voices in this strikingly lovely aria. There are more, lovely woodwind sounds, in particular from the recorders, in On the valleys, dark and cheerless from The Triumph of Time and Truth. Davies’ vibrato is lovely, yet his longer phrases are so pure. The King’s Consort’s sensitive playing is the perfect foil for Davies in this gem of a performance. 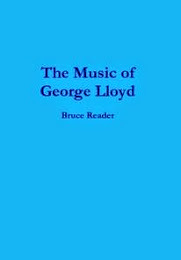 There is a lively conclusion to this fine disc, with the uplifting aria How can I stay when love invites from Esther. How apt the words of this aria are ‘With joy, with pleasure, I obey. To thee I give the day.’ What a joy and pleasure these performances are. I know that I have scattered this review with many superlatives but this is merely because this new release is outstanding in every way. The recording from The Menuhin Hall, Stoke d'Abernon, Surrey, England is first rate. There are full English texts and excellent notes by the renowned Handel scholar Professor Donald Burrows. A video was also recorded at the sessions for this disc and will be launched on the Vivat Music website www.vivatmusic.com during January 2014. What more could one want.